Cody Maverick: What? You mean like singing and dancing? Nah, man, I just surf. Anyone who knows me, knows that I love me some penguin. Of course, I am referring to the line of clothing and not the waddling bird. Regardless, I too fell in love with the emperor penguins along with the rest of the world a couple of years back when THE MARCH OF THE PENGUINS swept the summer documentary box office. That was the same summer the mischievous animated penguins of MADAGASCAR had people begging for more (which they were unfortunately given months later with the dreadfully drab short, A CHRISTMAS CAPER). Penguins were all the rage. After winning the Best Documentary OSCAR, the penguin love only continued to grow with the holiday hit, HAPPY FEET. The premise there, after essentially crafting an animated reenactment of the mating ritual outlined in the aforementioned documentary, penguins sing to express themselves while one dances instead (see above quote for cheeky acknowledgement). 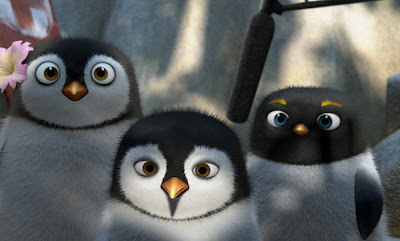 HAPPY FEET was a big success and went on to a surprising win for Best Animated Feature at last year’s Academy Awards. 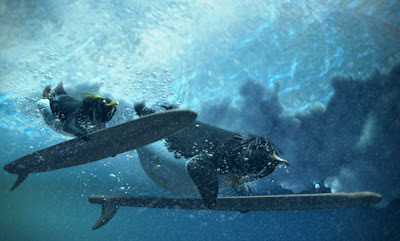 And so the trend continues with another animated feature about penguins, SURF’S UP. Only now it may seem the public is growing weary of these tuxed-up birds. Perhaps there is only so much penguin love to go around. 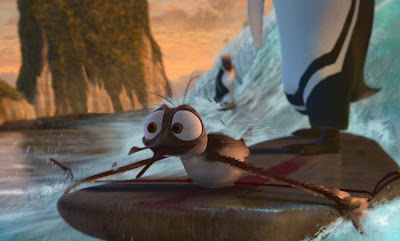 It’s a shame really because SURF’S UP may be the best of the (animated) bunch. To differentiate itself from all the previous penguin fare, SURF’S UP, is constructed as a mockumentary. To capture an on-the-cuff style, a special motion capture camera system was mounted to an old Sony video camera to give the illusion that the movie was shot with a hand-held camera. Factor in jump cuts and film scratches from different stocks and you have a style that is both authentic and dynamic. 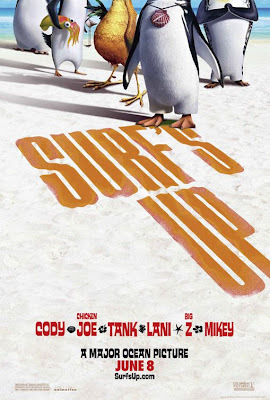 A film crew (voiced by the actual directors, Ash Brannon and Chris Buck) has decided to follow an aspiring surfer by the name of Cody Maverick (voiced by Shia LaBeouf) on his journey that begins at his humble home in Shiverpool to the Penguin World Surfing Championship. With blizzards gusting in the background at home and forestry looking lush and wet at the championship, SURF’S UP uses nature to not only establish its fish-out-of-water story but to wow its audience. The beauty of the animation itself is enough to make SURF’S UP a serious contender come award season when the waves of praise come crashing ashore. Set amidst these beautiful backdrops is a bevy of lovable, genuinely hilarious characters. What is perhaps the film’s strongest achievement is the spontaneity it creates in a style that is so meticulously designed and planned. The penguins sincerely seem as if they are on camera. They are both uncomfortable and candid. At home, Cody is surrounded by his doting, doubtful mother (Dana Belben) and oversized, pesky brother (Brian Posehn). The tension in this family is palpable and unnervingly funny. En route to the competition, Cody comes into contact with talent scout, Mikey Abromowitz (Mario Cantone), whose neurosis run through his head almost as fast as his little bird legs run on land and an oddball surfer/rooster named Chicken Joe (Jon Heder), who is as laid back (read potentially stoned) as one would expect a surfer to be. Cody is taken under wing by a former surfer named Geek (Jeff Bridges) once at the competition and their playful interactions keep your gliding through to the finals. SURF’S UP packs in more unexpected laughs than one would expect and the fact that they are unexpected is what makes it so incredible. SURF’S UP also makes sure to bang home an important lesson for the kids. After all, this is a summer family film and there needs to be a lesson learned. Cody learns a number of things along his way but they all amount to understanding a thing or two about patience. “Winning isn’t everything” and “There are more important things to life than winning” make appearances but what is most important is the philosophy that will help Cody win out overall. Stop fighting and learn to ride the wave. It is a lesson that even the filmmakers should have heeded as there are times when the imposing hand of the powers that be can be felt in the film’s construction to ensure it is as marketable as possible. Oddly placed soundtrack choices and shots that could not have been caught by documentary filmmakers undermine the credibility of the mockumentary but hardly take away from the fun to be had. SURF’S UP will surprise you, crack you up and leave you wanting to catch the wave again and again. The only question left to answer is whether polar bears will be over saturating the marketplace after the people who brought you THE MARCH OF THE PENGUINS bring you AN ARCTIC TALE later this summer.